Delivery times may vary, see cgv contact us before the purchase to have the exact deadlines. By clicking on immediate purchase, the customer certifies having read and accepted the general conditions of sale! Available at the bottom of this. The new variator was developed thanks to the multi-year experience acquired on the circuits. It is the evolution of previous generations of drives and offers performance at the highest levels. Ø 35 x 25 x 0.5. 8 sliders for multivar 2000. 8 htroll ø 25x14,9 gr. Demipoulie mobile for multivar 2000 mhr. Hub (ø 35x25x75,8 mm) for multivar 2000 variator. Grease tube - lubricating grease gr. Attention: The grease supplied with the kit must be put in the inner groove of the hub and the spacer. Yamaha tmax 530 from 2012. The multivar 2000 mhr for yamaha t max 530 is renewed !! there is always room to improve! 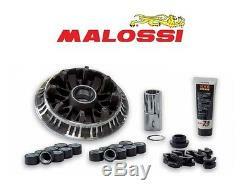 Malossi technicians have gone further to offer a product really top! Multivar 2000 mhr for yamaha t max 530 ie 4t lc 2012 (j409e), the new drive developed from the multi-year experience gained on the circuits and cad-cam technology available today, is the evolution of the previous generations of drives and offers performance at the highest levels! The new version appears with a renovated exterior look with diamond finning. While keeping the structure of the variator unchanged, malossi technicians have been able to perfect it by adding a ring that allows to further customize the setting and the range of exchange and completing it with the sliders. The exchange curve shows that the work of the technicians has been focused on the subsequent enlargement of the operating range of the drive, in particular the short speed, gaining even more acceleration and recovery as well as improving the exchange rate linearity. , keeping the engine speed almost unchanged during the entire changeover phase of the drive. We did better: we subsequently reduced the tolerances between the hub and the bushing and we reduced the roughness to a minimum to obtain a truly incomparable variator! Expanded range (especially short speed). Currency linearity improved throughout the phase. Excursion ramp of the modified rollers to allow better linear operation to maintain the engine speed at maximum power. Rectified chrome cemented steel hub. New monolithic rolls made of even more efficient materials. Supplied with two different series of rollers to change the speed of the exchange curve of your vehicle by adjusting velocity and acceleration to perfection. A ring included in the kit. Dekra certification gmbh has certified that malossi, in the production of complete variator cvt kits, has introduced and effectively enforces a quality management system in accordance with the standards required by the German and international Road Traffic Act (kba). Other thousands of pieces with misterbike. The processing time of your order can vary 5 to 15 working days, contact us before the purchase !! anti-theft devices, batteries, spark plugs, chain kits, pinions, crowns, chains, clutch discs, air filters,, oil filters, fuel filters, oils, engine gaskets, spinnaker seals, brake levers and clutch grips, handles, jaws brake, fixed and floating brake discs, brake pads, motorcycle tires, cross and enduro tires, scooter tires, quad tires, inner tubes, lamps and spotlights, wheel bearings and steering bearings, spraychain, turn signals, mirrors, fork tubes, cables, tank caps, handlebars, saddles, bolts, handlebars, valves and stoppers, contactors, workshop saddles, footrests, belts, exhausts, tools, top cases and windshields. Helmets, rain gear, clothing and anti-cold accessories, tire cover, etc. 03.25.55.74.71 Monday to Friday from 9h-12h to 14h-18h. 06.62.69.50.19. The item "malossi variator yamaha t-max 530 tmax multivar variator mhr next 5117082" is on sale since Thursday, July 2, 2015. It is in the category "auto, motorcycle parts, accessories \ motorcycle parts \ other". The seller is "misterbike-fr" and is located in / at bettancourt la ferée. This item can be shipped to the following countries: france, united kingdom, germany, belgium.